In order to streamline the workflow with the raw shots taken in the new Pixel Shift Multi Shooting mode offered by the Pentax K1(-II)/K3-II and Sony A7R-III cameras, and provide a way to use popular RAW converters (Adobe Camera Raw/Lightroom, Capture One, and some others) for processing these shots, we’ve developed the PixelShift2DNG application, which converts Sony and Pentax shots taken in Pixel Shift mode to DNG, supported by most (but not all) RAW converters. Convert ARQ file formats (and ARW file quartets previously combined into one file by the program Sony Imaging Edge) or 4-shot PEF/DNG containers (taken with Pentax K1/K1-II/K3-II cameras) to regular DNG files. The resulting DNG files can later be processed in familiar applications like Adobe Lightroom and Camera Raw, CaptureOne, Iridient Developer, Luminar, and others. Mac users: if you have the previous, Sony-only, version of the application named SonyPixelShift2DNG installed, it will not be removed automatically upon the install of the current version. Please drag SonyPixelShift2DNG to Trash to remove it manually. 0.9.3-0.9.5: Beta version expire date moved to 15 Jan 2019: we're working on Pentax K1 support, but it is not ready yet. Preferences - Reset Defaults button. 0.9.7: Beta version expire date moved to May 01, 2019: we're working on Pentax K1 support, but it is not ready yet. Mac OS X/macOS 10.6-10.13, 64-bit processor (so, all Intel Macs, except for some models from 2005-06 with Core Solo and Core Duo processors). Screen resolution no less than 1600x900. 50MB of disk space for the application. Please send us feedback regarding this application in our forum or using separate feedback page section. The new Sony A7R-III has a new mode in it, the Pixel Shift Multi Shooting, in which the camera takes 4 consecutive shots applying a one-pixel shift between the shots. With ordinary RAW files taken with a regular Bayer sensor, only one of the four RGBG color channels is sampled in each pixel location. To guess the unknown color data, we need to preform demosaicking. However, by performing one-pixel shifts of the sensor during the shoot, we can sample information about all four color channels at each pixel location. Thus, we don’t need to demosaic during the conversion anymore, which decreases moiré, improves resolution, and we have an option to average the green channels for every location, improving the dynamic range in the combined channel by approximately half a stop (obviously, one can only shoot static scenes in such a mode). The workflow for processing files taken it Pixel Shift Multi Shooting mode suggested by the manufacturer (Sony) is as follows: combine four ARW files into one ARQ file using the Sony Imaging Edge Viewer application and process the resulting ARQ file in the Sony Editor. 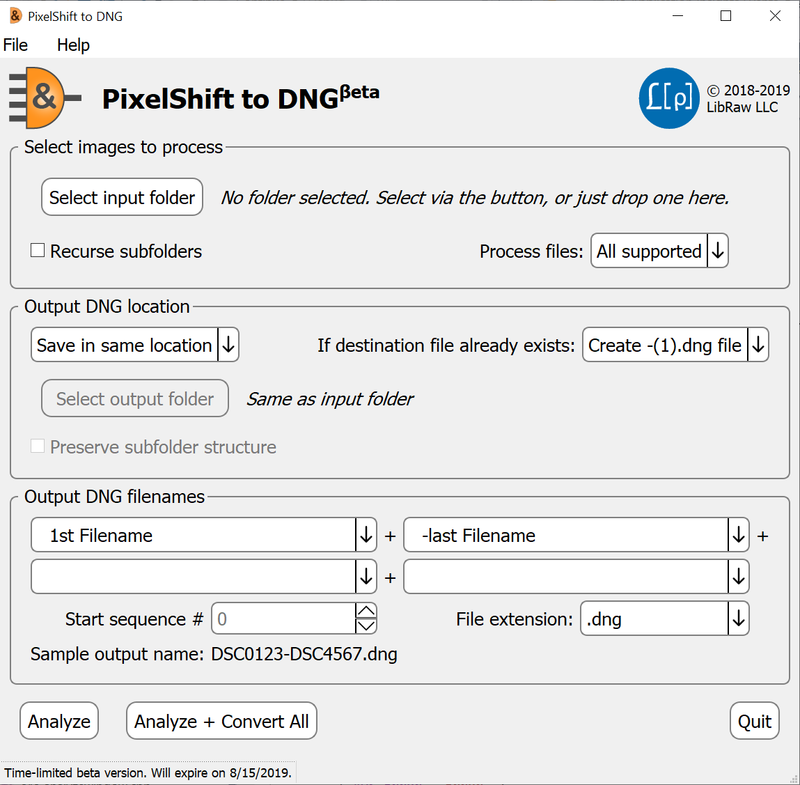 So, now we offer PixelShift2DNG, which allows to analyze Sony A7R-III shots, separating Pixel Shift groups (4 ARW files) and ARQ files, and convert them to DNG. * There is no 32-bit version right now: to work, the program needs 700+MB of free RAM, which is unlikely on a 32-bit system.